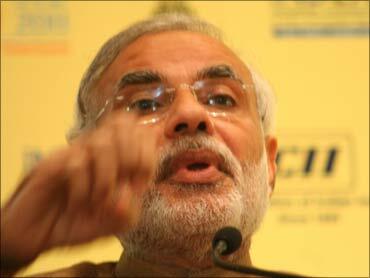 Rediff.com » Business » Big guns pledge over Rs 160,000 crore for Gujarat! Big guns pledge over Rs 160,000 crore for Gujarat! Heaping praises on Gujarat Chief Minister Narendra Modi's leadership for not only driving industrial growth but also boosting rural development, India's industry bigwigs on Wednesday pledged to invest in excess of Rs 163,000 crore (Rs 1,630 billion) in the state. They had all gathered at the fifth edition of Vibrant Gujarat Summit 2011 (VGS) in Gandhinagar. Meanwhile, Adani Group chairman Gautam Adani announced Rs 80,000-crore (Rs 800 billion) investment in ports, power sector and infrastructure in Gujarat. He, however, did not specify the timeline for the investments. "On the occasion of VGS we announce an investment of more than Rs 80,000 crore in port, power generation and infrastructure in Gujarat," Adani said, while speaking at VGS. "While two new ports -- one each at Hazira and Dholera are being developed we are also expanding the existing ports at Mundra and Dahej. With this we have a goal to create 200 million tonnes per annum of port handling capacity by the year 2015," he said. "In power generation while we have commissioned 2,000 MW at Mundra, additional 2,600 MW will be commissioned by March 2012. Further we are also building 3,300 MW at Bhadreshwar in Kutch, 600 MW at Dahej and 4,000 MW at Dholera SIR," Adani said, adding all the above power plants shall be completed to create a capacity of 15,000 MW by 2015. "As an integrated infrastructure conglomerate we are also developing LNG terminal, infrastructure parks, supporting railway lines and supporting facilities," Adani said. "Projects of more than Rs 35,000 crore (Rs 350 billion) for which we had signed MoUs at the time of Vibrant Gujarat Summit in 2007 and 2009 have been fructified," he added. 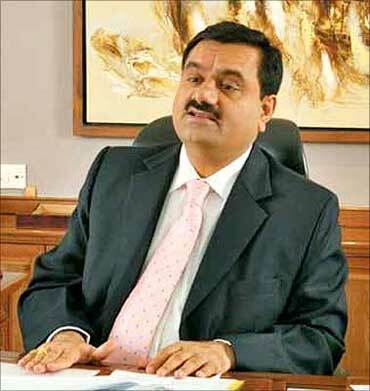 Image: Adani Group chief Gautam Adani. Anil Ambani said on Wednesday that his ADA Group will invest Rs 50,000 crore (Rs 500 billion) in Gujarat in the next 5-7 years on various projects as the firm looks to tap opportunities in the state. "We are committing to invest Rs 50,000 crore in the state of Gujarat in gas-based and coal-based power projects in the next 5-7 years", Ambani said while speaking at the 5th Global Summit of Vibrant Gujarat in Gandhinagar. 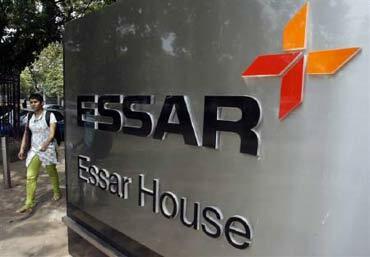 Diversified conglomerate Essar Group on Wednesday said it will invest Rs 30,000 crore (Rs 300 billion) in Gujarat for projects in various sectors, including power and refinery. "Essar has committed to invest in Gujarat Rs 30,000 crore in power, refinery, ports and water infrastructure," Essar Group chief executive Prashant Ruia said here during the 5th Global Summit of Vibrant Gujarat. He, however, did not specify the timeline for the investments but said the earlier investments committed by the group in the state have been executed. 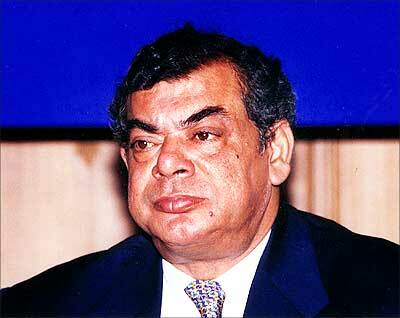 Image: Essar Group chariman Shashi Ruia. Essar Group is a major player in the port sector in Gujarat. Its ports and terminals business operates a crude oil and petroleum products terminal at Vadinar in the state. The group is also constructing a dry bulk port at Hazira and a coal jetty at Salaya, all in the state. It also has a 14 MTPA petroleum refinery at Vadinar which started commercial production on May 1, 2008. Besides, it also operates a 515 MW gas-based power plant at Hazira. Farm equipment-to-software group Mahindra & Mahindra on Wednesday said it will invest Rs 3,000 crore (Rs 30 billion) in Gujarat to step up presence in the hospitality and real estate sectors in the state. "Our group companies have signed six MoUs with the Gujarat government totalling an investment of Rs 3,000 crore (Rs 30 billion)," Mahindra & Mahindra vice chairman and managing director Anand Mahindra said at the 5th Global Summit of Vibrant Gujarat. He, however, did not specify the time frame for these investments. Mahindra Lifespaces, the real estate development arm of the $7.1-billion Mahindra Group, has signed two MoUs with the state government. "Mahindra World City is developing a real estate project spread across 500 acres of land," he said. 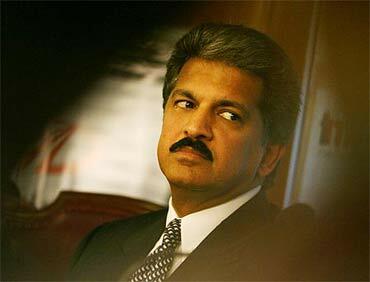 Image: Mahindra vice chairman and managing director Anand Mahindra. Another group company, Mahindra Holiday & Resorts, that runs the Club Mahindra resorts, will open seven new resorts in the state, Mahindra said, adding, "all these new projects will create a lot of new jobs." Moreover, investments will also be made on solid waste management and domestic waste management projects, he added. Acknowledging that the investment by M&M is much less compared to those announced by other corporates during the summit, Mahindra said, "But we are doing it with passion." "Mr Modi, I hope you are not angry now as you have been saying that we do not make investments in the state," he quipped. 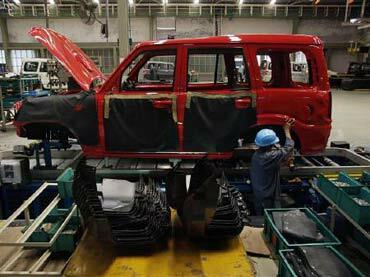 Image: Inside a Mahindra and Mahindra plant. 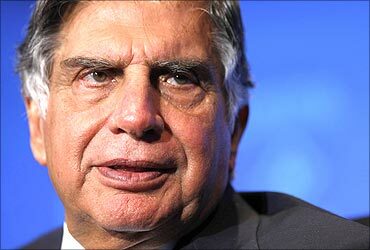 Praising Gujarat Chief Minister Narendra Modi's leadership for not only driving industrial growth but also boosting rural development, Ratan Tata on Wednesday said the Tata Group will partner the state in providing transportation into the hinterlands. "The leadership of Narendra Modi has proved that Gujarat is not only seeing industrial growth but is also witnessing rural development," Tata said at the 5th Global Summit of Vibrant Gujarat. The Tata Group has signed an MoU with the Gujarat government to provide rural transportation, he added. This will be in addition to the ongoing rural initiatives such as skills development activities, sanitation and water projects where the group is already a partner. "Today the group has a total investment in the excess of Rs 30,000 crore (Rs 300 billion) in Gujarat and employs 50,000 people directly and several more indirectly. I am here to say that the investments will continue as we move forward," Tata said. Unlike Anil Ambani-led Reliance Group or the Adani Group, Tata did not announce any mega investment. Image: Ratan Tata with Narendra Modi. He, however, said that the Tata Group's participation at the Vibrant Gujarat Summit reflects its involvement in Gujarat. Group firms like Tata Chemicals, TCS, Tata Power, Tata Teleservices are already investing in the state. ". 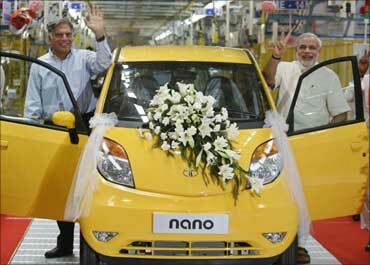 . . and of course the most visible one is Tata Motors for the Tata Nano," Tata said, while thanking Modi for the swift action that led to the setting up of the small car plant at Sanand in the state. "When we had to withdraw from Singur and were looking for a location which was safe, we had offers from many states and of course one from Mr Narendra Modi. He promised to confirm the allotment of land within a few days and the few days became three days," he recalled. Tata Motors had shifted its manufacturing base from the original location at Singur in West Bengal to Sanand in Gujarat in October 2008 following violence and political opposition. Mukesh Ambani-led Reliance Industries said it has signed a pact with Gujarat government to develop Pandit Deendayal Petroleum University into a top world class institute. 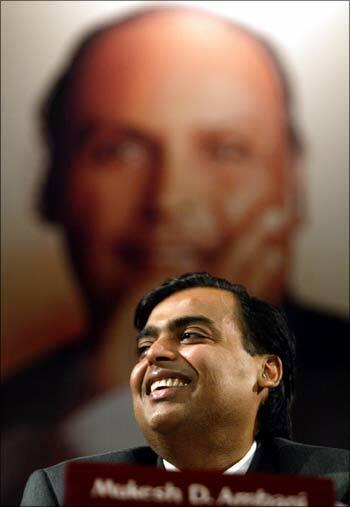 "In the last few years Reliance has been associated with Pandit Deendayal Petroleum University and today the company has signed an MoU and has envisaged to develop this university into a premium world class university," Reliance Industries chairman and managing director Mukesh Ambani said. Promoted by the Gujarat State Petroleum Corporation, the university offers undergraduate and post-graduate energy education programmes and intensive research initiatives. Speaking at the 5th Global Summit of Vibrant Gujarat, Ambani said that Reliance "has been an integral part of Gujarat's success story. Rather I would say an emotional part of its success." 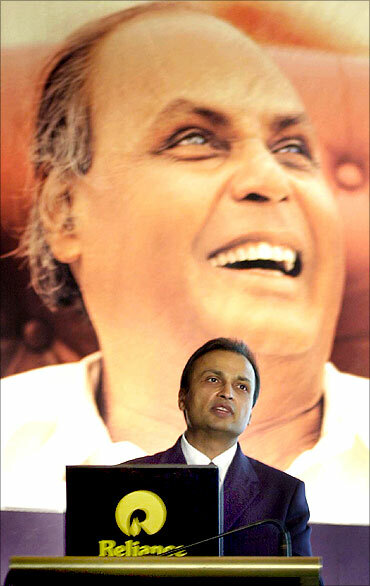 Recalling his father late Dhirubhai's insistence of sustaining the spirit of being a Gujarati company, Ambani said Reliance has managed to achieve the same. 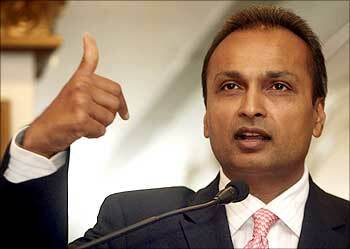 "Reliance will remain involved in Gujarat and maintain the same," he added. 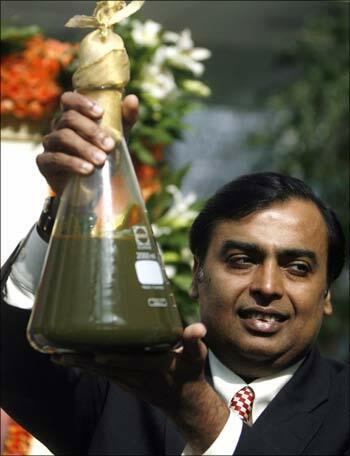 Already RIL has made Jamnagar in the state the petroleum hub of the world. It has two refineries there with a total capacity of 1.24 million barrels per day (MBPD) of nominal crude processing capacity, the single largest refining complex in the world.